A cloud-based veterinary medical records and practice management application powered by Vetspire's artificial intelligence platform. No longer will you have to stay two hours after your practice has closed to finish your medical notes. Let Vetspire help you finish your notes faster and deliver better patient care. From the powerful artificial intelligence to the beautiful interface, Vetspire has been designed to make you the most effective and happy veterinarian you can be. Vetspire focuses on getting you the relevant medical history so you can deliver the best care—from cleanly displaying a searchable medical history to seeing a quick glimpse of the problem list and active medications. "We didn't just want to create a smart EMR, but also one that is a delight to use. The computer should do everything it can to make your life as a veterinarian as easy as possible." Artificial intelligence helps write your notes. Vetspire's AI assists you at every step of the way while you write your medical notes so you can stop worrying about documentation, and get back to being a veterinarian. 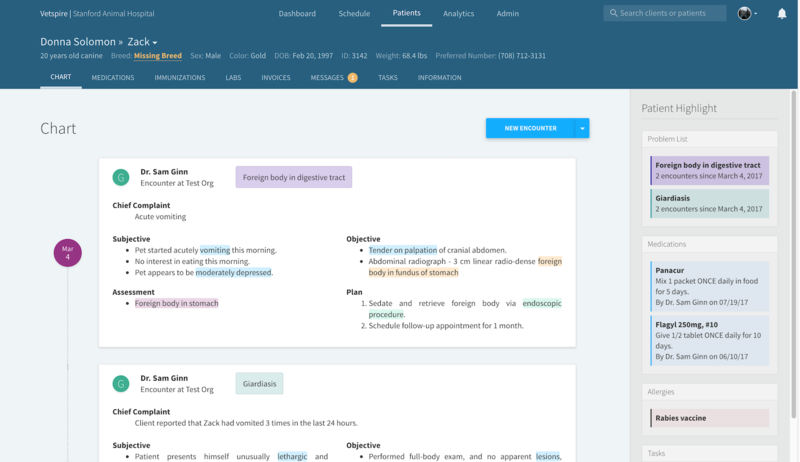 From finishing your sentences to recommending observations and treatment paths, our state-of-the-art AI technology learns from your personal style as a veterinarian to help write your notes. 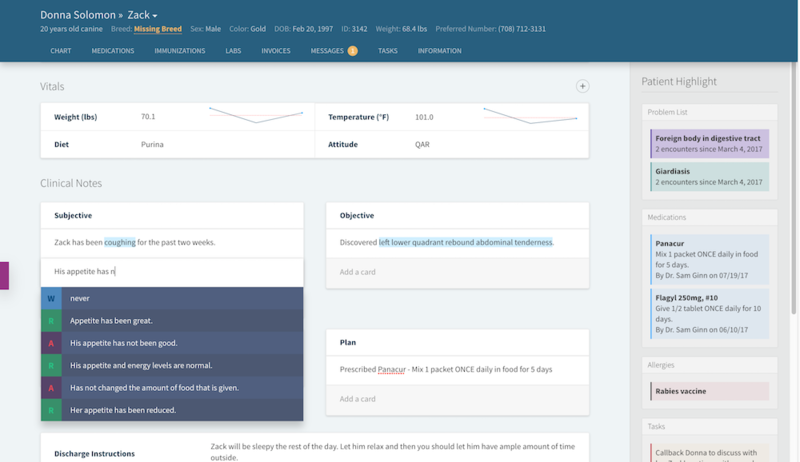 "We wanted to craft an experience that augments a veterinarian's workflow—helping them finish the tedium of documentation efficiently and accurately. Your software should be a boon, not a burden." "We challenged ourselves to craft an experience for veterinarians that not only saved them time and made them more efficient, but also improved the delivery of patient care. Every time a veterinarian documents their treatment of a patient on Vetspire, they are contributing to a nationwide research initiative to provide veterinary medicine with large-scale population health studies. Our mission is to help push the profession of veterinary medicine forward through smarter technology." Vetspire automatically tracks and analyzes everything about your practice, from clients and procedures to inventory and billing. Vetspire's AI will track disorders to aid population health management, analyze appointment behavior and trends, and map your clients' locations to predict marketing trends. "We understand that growing a veterinary practice is hard. 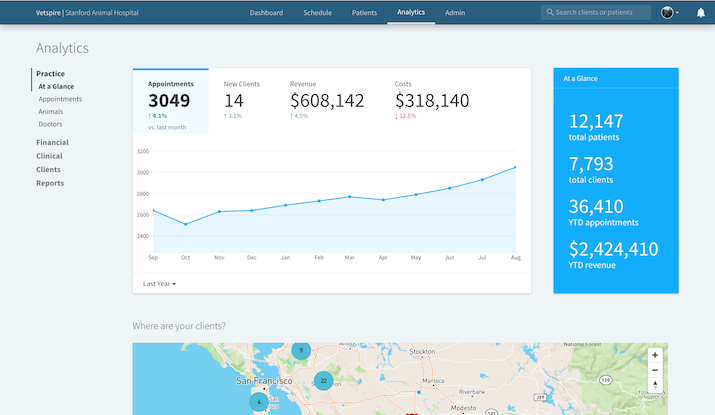 We want to give you every piece of data to help you take your practice to the next level, and display actionable insights informatively." A seamless experience for both veterinarians and clients. Assign tasks to both yourself and clients to automatically schedule follow-up appointments, callbacks, and more. Seamlessly message clients via email and text messages right in Vetspire. Manage appointment reminders and scheduling with ease. "Your clients should feel special when they're with you. 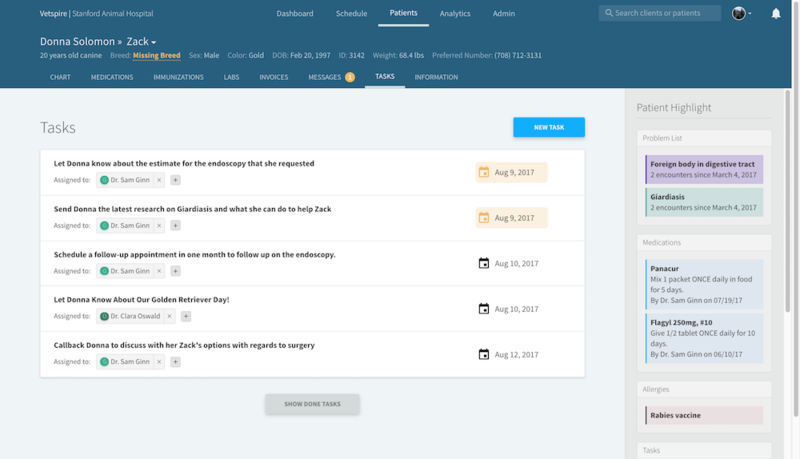 That's why we've designed the Vetspire patient portal to make it easy for you to manage your communications and appointments with them all in one place." At Vetspire, our mission is to make your life as a veterinarian as easy as possible, and that means we've got you covered if you ever need support. 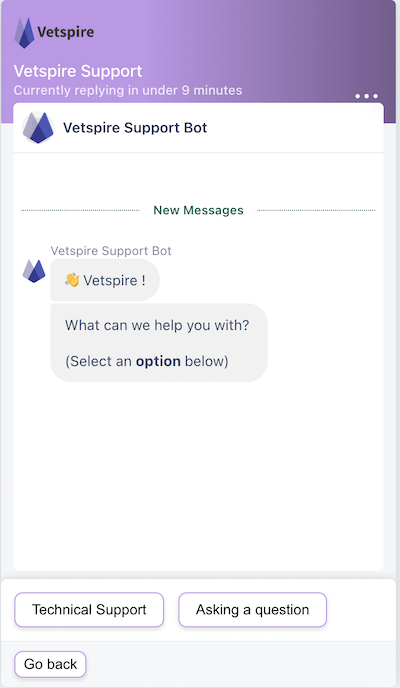 If you ever need help figuring out how a feature works, you can chat with us directly in Vetspire or call our support line directly, and we'll help you immediately. "We want to be there to help as much as we can as you manage your growing practice. Whether you need training, guidance, marketing help, or a custom-built feature, we're here for you." We'd love to meet you, and have you join our growing family of veterinarians. Fill out this form, and we'll reach out to you as soon as able. © Vetspire — fgspire, Inc.
Vetspire is based in Stanford, California, but we love meeting veterinarians everywhere.